Editor's note: Cameron Taylor is Emory's vice president for government and community affairs. On March 23, President Donald Trump signed the Consolidated Appropriations Act (the Omnibus), containing all 12 appropriations bills for Fiscal Year 2018. The bipartisan compromise funds the federal government until the end of the current fiscal year, ending Sept. 30, 2018. Thanks to the tireless efforts of advocates across the country, the new law encompasses major victories for research and education programs. The new law provides the largest research funding increase in nearly a decade. The National Institutes of Health fared particularly well, growing $3 billion (nearly 9 percent) over last year. The Centers for Disease Control and Prevention gets a significant funding boost — $1.1 billion — and the National Science Foundation will see a 4 percent funding increase. The law also ensures the maximum Pell grant award will rise to $6,095 (+$175) and increases funding for Federal Work Study (14.1 percent increase) and the Supplemental Education Opportunity Grant (14.6 percent increase). Why do increases in federal funding matter to Emory’s mission? Emory is proud to partner with the federal government. Leveraging federal funding enables Emory to grow and strengthen our research enterprise and expand upon our students’ access to financial aid. Emory supplements federal dollars to develop cutting-edge research that improves lives now and for future generations, research that is either too basic or risky for the private sector. In FY2017, Emory researchers received $628 million dollars in total research funding: $384 million of Emory’s research funding came from the federal government, while the remaining 39 percent came from non-federal sources. Across the research enterprise, Emory University invested over $151 million. These investments range from covering unreimbursed indirect costs to university funding for internal research awards. Emory amplifies federal financial aid dollars. Our endowment enables Emory to significantly expand upon the financial aid resources available to our students. In FY2017, Emory contributed $304 million to our students’ financial needs, while the federal government provided $143 million for our students’ financial aid funding. With the guidance of the Office of Government and Community Affairs (OGCA), Emory advocates have met with policy makers dozens of times over the last year, to discuss, and in some cases, demonstrate, the important work being conducted at Emory. The OGCA appreciates and celebrates this partnership. If you would like to help advocate for research, please sign up for the Emory Research Advocacy Network (ERAN). ERAN is a network of students, alumni, patients, staff and neighbors committed to engaging with legislators and their staffers to advocate for research. We must build upon the current momentum and push for continued investment in research and education during the FY2019 appropriations process. As the FY2018 Omnibus demonstrates, our collective advocacy efforts can make a difference on Capitol Hill. In the coming months, Emory will continue to advocate for issues of concern to our students, faculty and staff. A key area of focus will be the reauthorization of the Higher Education Act. The House bill has proposed elimination of the Public Service Loan Forgiveness Program, as well as creating new federal loan limits that would force many students to seek more expensive private loans. To date, OGCA advocacy on this bill has already included numerous meetings with Hill staff and a letter from Emory President Claire E. Sterk to Georgia’s congressional delegation. Issues impacting Emory’s international and immigrant students continue to be a high priority. The OGCA is working to educate the Georgia delegation about the concerns of our international students, including the Administration’s pending consideration of restricting visas for Chinese citizens. Work also continues in support of Deferred Action for Childhood Arrival (DACA) students who seek to attend college without fear of deportation. Sterk has visited Capitol Hill twice in the past year to discuss this issue, and we had hoped to see its resolution included in the Omnibus. We’re working with the Association of American Universities (AAU) to influence federal agency and congressional next steps on these issues. Perhaps the biggest challenge to congressional action is the upcoming mid-term elections. Now that the FY2018 omnibus has been completed, there is no urgency to pass any other major pieces of legislation this year. Even the FY2019 appropriations bill may be kicked into next year by a continuing resolution. 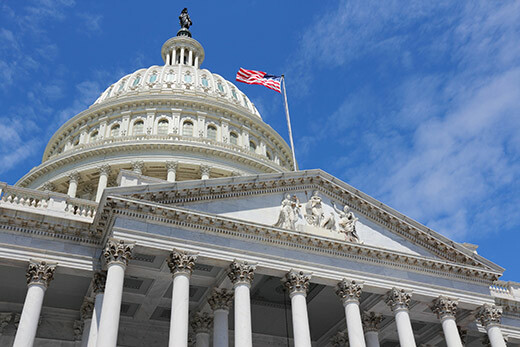 Nonetheless, Emory will continue to advocate for those priorities that advance our mission, whether it be in the FY2019 appropriations process, an infrastructure bill or another legislative vehicle of interest.